If there were an award for “Bicycle with the Lowest Carbon Footprint” this frame would win. Bamboo bicycle frames offer surprisingly good power transfer while maintaining a smoother ride than metal or most carbon frames, thanks to bamboo’s natural vibration dampening qualities. Bamboo frames are also extremely durable, resisting damage from stress and impacts better than a carbon frame. 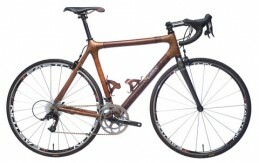 Calfee has bamboo bikes down to a science and offers a ten year warranty to prove it.